Most people book a Flavours cooking holidays because they love Italian cuisine, and think cooking and eating in warm, beautiful Italy, with great produce on the doorstep, will be a blissful holiday where they’ll learn, too. Caroline Toplis booked her first Flavours cooking holiday in 2010, to help cheer herself up having recently become a widow. She wanted to take a positive step forward in her new life on her own. She says, ‘I did a lot of Googling… and whilst the company clearly welcomed solo travellers, it didn’t look like a classic holiday for single people which appealed to me. I just wanted to get away and not have to impose as a ‘gooseberry’ on my friends who were all busy making holiday plans at the time.’ Caroline said she was actually surprised at the end of this first week away in Sicily that she’d had a great time! This is where she met Matt. But Caroline didn’t even think romance was on the cards until they returned home. The two shared a love of cooking, and continued to chat via email back in the UK. One thing led to another and 18 months later the two married, with several of their travelling companions at the ceremony. They have since enjoyed a Flavours cooking holiday together. Caroline has said she is very glad she made that first step into holidaying on her own. 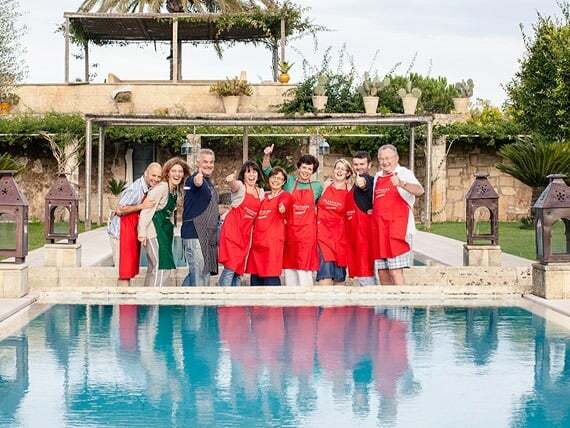 When Lindsay booked her Flavours cookery holiday at Villa Limonaia on the Amalfi Coast as a 60th birthday celebration with her extended family, we set to work to help make it an extra-special trip. She and her family celebrated together, cooking, travelling to nearby towns, eating and drinking. The Italians are fans of eating wild boar – cinghiale is a Tuscan speciality, with hunting both a tradition and a passion. With pasta or in a stew, there are countless wild boar specialties, and you can taste them all at many Tuscan food festivals. But even with an abundance of the beasts in the countryside, it’s still quite rare to come across one. They tend to be shy. They have a keen sense of smell, but their eyesight is poor, so once they smell your presence they may come closer to see you. But usually they will soon run away if you start making a noise or talking. So, our guests on a cooking holiday in Tuscany were somewhat surprised to see a wild boar ambling confidently into the estate garden where they were staying. They spied the animal from the villa, and saw it head straight for an apple tree with conveniently low fruit. And once the animal had got a taste for the juicy apples, he returned on several occasions to steal more – but he was only ever interested in those apples, and not in the cooks themselves! Food is such an important part of life in Italy, that as soon as you start cooking there, you’re bound to pick up a few useful phrases. You will already know the name of many pasta shapes, without even having thought about it. Learning the language is not the reason most people come on our cooking holidays, of course, but many of our guests find that even if they don’t speak a word of the language before they go, a few trips to markets, shops, towns and restaurants in the area with a local expert helps them pick up key words and phrases. There is always a local guide and expert on our trips, and they are more than happy to help you with useful phrases… Here’s a few to get started. Posso avere più il vino si prega? – Can I have more wine please? People can be nervous about coming on our holidays – particularly if they’ve never been on an activity holiday before. Many of our guests come alone, and some come with a friend or a partner. It’s natural to be nervous, but we find that anxieties dissipate the minute you arrive and are introduced to the local expert and to the rest of the group. Our guests have found that sometimes great friendships start when you simply ask the person cooking next to you for a word of advice. It’s common for people to think they won’t be good at the activity. In fact, if you’re on a cooking holiday, there is always a wide variety of abilities, and everyone ends up exceeding their own expectations of what they can achieve. Our experienced staff are there to help, whatever your level. The upside of any anxiety is that it’s bonding. Invariably you will connect with the other members of your group – you’re bound to have shared interests as you’ve all picked the same holiday. And just being in Italy, cooking and eating is such an enjoyable experience that people are relaxed and happy and tend to get along very well. Some of our guests become such good friends, they arrange to meet up again on future Flavours holidays. The great thing about all doing activities together is that you have a shared experience and there’s always plenty to talk about from your day. But, don’t worry, there’s also plenty of time to yourself if you’d like it, whether that’s meandering in the nearest town, simply having a rest in your room, or relaxing in the sun with a good book.